Leave a comment on THIS post through Tuesday, October 9, 2018, to be entered in the DRAWING for a copy of the book below. If you mention in your comment that you’re a follower (see right sidebar to follow), I'll add your name a second time in the drawing. U.S. mailing address required to receive a paper book. I may or may not have read books offered for giveaways. The mention and giveaway of books on my blog do not in any way indicate any manner of my endorsement of said books. Read book giveaway details at Disclaimers. To help provide you security, please leave your email address like this: johnATyahooDOTcom. Winner announced in next Thursday's blog post. Pat Nichols launched career number two as a novelist, proving it’s never too late to follow your dreams. Drawing on years of corporate experience working with hundreds of amazing women from all walks of life, she creates stories about women who face challenges in the pursuit of their dreams. She lives in an Atlanta suburb with her husband of fifty-plus years, is the mother of two, and grandmother of three. She is grateful for God’s blessings and unfailing love through all of life’s peaks and valleys. 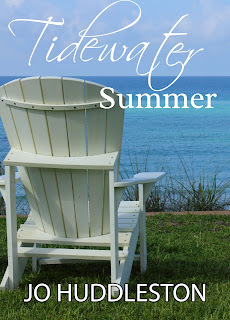 Please enjoy the article below by Pat Nichols about her writing The Secret of Willow Inn. After completing two works of fiction based on real people—neither manuscript was ready for primetime—the key characters in my third novel came straight out of my imagination. Two women, strangers from different backgrounds, and a convicted felon returning to the scene of her crime. I visualized them for more than a year. The way they looked, their personalities and their history. It was time to bring Emily, Rachel, and Sadie to life. Next came a decision about the settings. A small town struggling to survive and a big, bustling metropolis. Because I live thirty miles from downtown Atlanta, I chose it as the city. I can’t count the number of times I used Google Earth to pinpoint locations I used in the story. Although I’m old enough to know about slide rules, I’m grateful modern technology allows me to conduct research from my living room. Not that I don’t like to get out and about. It’s simply a more efficient use of time. When it came to the second setting, I wanted to create a community I could conform to the story. Beginning with a row of century-old storefronts facing a lakeside park and a block-long section graced with seven southern-style, antebellum homes. An abandoned hotel and historical general store completed the scene. Named after a fifty-foot waterfall and lush willow oaks, Willow Falls emerged. To solidify the details in my mind, I drew a map of my imaginary town. I’ve often pictured myself strolling along the streets chatting with the cast of quirky characters. As I began fleshing out the story, it’s amazing where the journey took me and my characters. More than once they surprised the heck out of me. My family thinks I’m slightly off-kilter when I talk about them as if they lived down the street. Not long after finishing the manuscript I was blessed to receive a contract from Lighthouse Publishing of the Carolinas (LPC). The first task from my acquisition editor? Add 20,000 words. Yikes. When I recovered from the shock, I got busy creating two additional characters and thirteen more chapters. The result was a story with greater depth and a few more twists. We were well into the second round of edits before settling on the title. The Secret of Willow Inn was the number one choice among readers who participated in a survey. From the beginning, I wanted this book to be the first in a series. In April I signed a second contract with LPC. 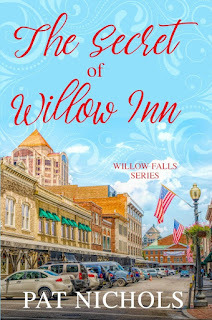 Book two in the Willow Falls saga is scheduled to release in January 2020. Although a title hasn’t been selected, I’m leaning toward Percy’s Legacy. I’m currently working on book three, with plans to continue the series until it comes to a logical conclusion sometime in the distant future. After all, there is much in store for Emily, Rachel, and Sadie. Plus, Willow Falls is rich with possibilities. Working with Lighthouse Publishing has been a pleasure and although I began my writing career late in life, I am grateful for the opportunity to pursue my passion. How long will I continue writing? Until God takes me home or I wake up one morning and totally forget where I left my computer. I’m counting on the first happening before the second. Welcome, Pat. What is your favorite dessert? Real key lime pie. The dense, tart version. Salmon grilled on a cedar plank with dill sauce on the side. Yellowfin tuna is a close second. What’s your favorite place you have visited? My husband and I have been blessed to complete our worldwide travel bucket list. Thanks to lots of travel points accumulated during my twenty-five-year career in the corporate world. My favorites are Venice, Italy and Eze, France. Y’all or You Guys? Definitely y’all. Although I was born in Illinois, I was raised in Florida and have called Georgia home since the eighties. Biscuits or Dinner Roll? Dinner roll, whole wheat. Spring, summer, winter, or fall? There’s something to love about every season. I suppose my favorite is fall. Mug or teacup? Mug. I might be the only southerner who doesn’t care for tea, sweetened or unsweetened. Please tell us a little about your novel, The Secret of Willow Inn. Two women fighting for their dreams, one who’s long-lost hers, are united by tragedy and a long-held secret. 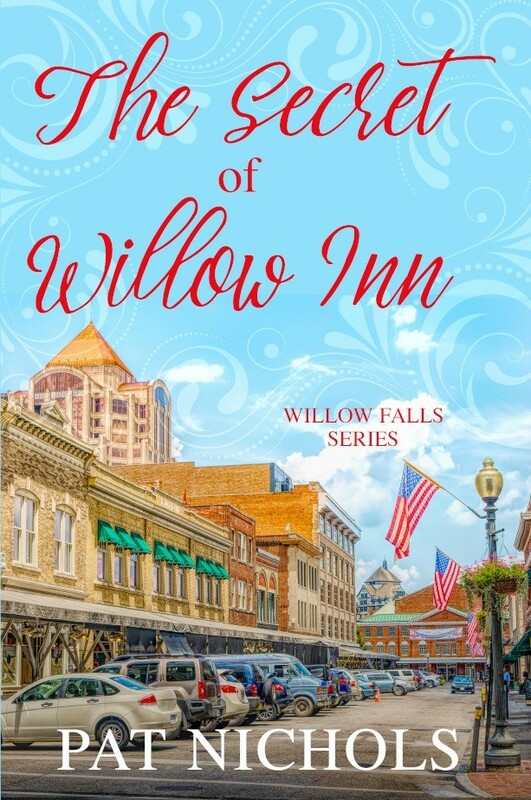 Where can readers purchase The Secret of Willow Inn? Available for pre-sale early October on Amazon. Official release January 2019. What do you like most about book series? Pat, thanks for visiting with my readers and me. Pat is offering an eBook copy of The Secret of Willow Inn (when available, date to be announced) to one commenter to this blog post. Commenters, to enter the book drawing please leave your comment on this post through October 9, 2018, and remember to leave your email address so I can contact you if you’re the winner. The winner of last Thursday’s blog post for a copy of A Daring Venture by Elizabeth Camden is Wendy. I’ll email you. Thanks all for commenting. Watch for more book giveaways. I enjoy book series because an author can focus in more on characters that were really in the background in a previous book. It’s fun to see the minor characters develop. I’m a follower. Thank you for your comment. Book two in the Willow Falls series expands on minor characters from book one and adds some new characters. Thank you for your comment. It's also fun for writers to keep the story going. Thank you, so glad this is a "gotta read." I love book series because the characters keep living and doing other things. You get to know the lesser ones better. As an author it's fun to keep discovering new things about characters. I like series because you get to hear from old friends as well as meet new friends! It's just so nice. I'm a follower. Happy Fall, Y'all! Old and new friends are the best part of series. Our church library readers enjoy our series books and are disappointed when they come to an end. You get to know the characters so much so that they become real. I am a follower. Looking forward to visiting Willow Falls. I love series and you are a new author to me so it would be so nice to win. Either way, I will find it and read it.